One of the challenges we have heard for new players to ZWEIHÄNDER Grim & Perilous RPG is that the book is too dang big. Despite the simplicity of the mechanics and inexpensive price point, getting players to create a character from a 600+ page book to create a character is a big ask, particularly whenever a Gamemaster really wants them to try ZWEIHÄNDER. We’ve listened, and today, we’re going to solve for it. The page numbers from the Player’s Guide will directly map to the same page as the Revised Core Rulebook, so that other products which reference page numbers (including those from the community content program the Grim & Perilous Library over on DriveThruRPG) will match across the entire line. In addition, we have an all-new cover featuring one of our favorite Professions, beautifully illustrated by Jussi Alarauhio. Plus, we’ll carry forward our new layout standards using sepia tones. The cover will come in a soft touch matte, using Grim & Perilous Studios collector’s print quality as with our previous books (which includes a ribbon, clay matte pages and smythe binding). Finally, it will feature artwork from Dejan Mandic – originally introduced in the Revised Core Rulebook – and freshly-illustrated borders. 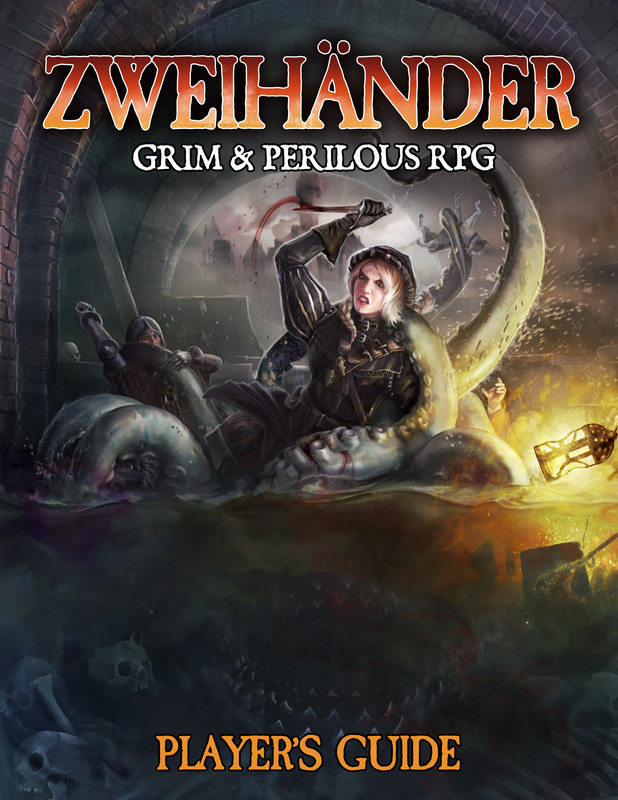 We anticipate having ZWEIHÄNDER Grim & Perilous RPG: Player’s Guide ready for pre-order by summer 2019. The Player’s Guide is the essential reference for players, containing everything you need to create a character: from professions to advancement, to backgrounds and skills, for intrigue and combat, to exploration and trappings, and for magick spells and rituals. Using this book, you will embroil your character in low fantasy & dark fantasy campaigns worlds, inspired by the works of Andrzej Sapkowski’s The Witcher, George R.R. Martin’s Game of Thrones, Glen Cook’s Black Company, Myke Cole’s The Sacred Throne, Robert E. Howard’s Solomon Kane, Scott Lynch’s Gentlemen Bastards and other ‘grimdark’ inspired games. With 72 professions, 43 expert professions, 6 ancestries, numerous backgrounds, a myriad of weapons and over 160 magick spells & rituals, you’ll have countless ways to create your vision of a grim character ready to embark upon perilous adventures.